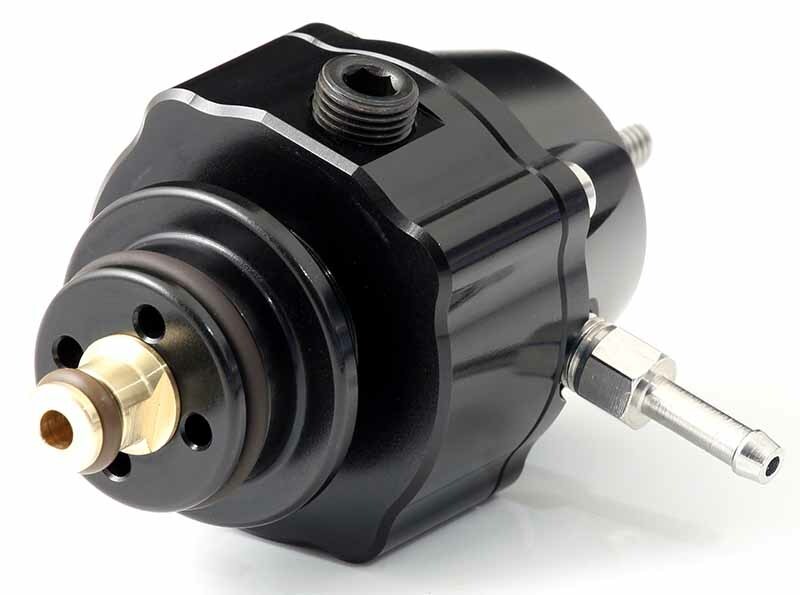 GFB’s popular and compact FX-S Fuel Pressure Regulator is now also available as a direct drop-in replacement for the common Bosch regulators that clip into the fuel rail. If you increase the performance of your engine, you need to ensure your fuel system can deliver the goods or you’re going to have a bad day! Upgrading the fuel pump is the first step, but doing this alone will usually result in excessive fuel pressure, especially at idle. This is because the factory Bosch regulators typically don’t flow enough to support larger fuel pumps, especially with turbo E85 setups that demand high fuel flow rates. Rather than replacing the entire fuel rail, or using an adaptor with a separate fuel pressure regulator, simply clipping in the FX-S 8051 will allow you to run a much larger pump setup even with the factory rail. And if you need to adjust the fuel pressure, that’s no problem - unlike the fixed-pressure Bosch regulators, the FX-S can be adjusted from 1.4bar to 5bar. Like all GFB FX regulators, the FX-S 8051 is compatible with pump gas, Ethanol, or Methanol, and also incorporates a soft Teflon valve seat (rather than metal on metal) that will always positively seal and hold fuel pressure on shut down for reliable engine startups. The double layer diaphragm has twice the reinforcing material of the single layer type used in most regulators, and as a result the burst strength exceeds 1000psi! The 1/8” NPT port can be used for a fuel pressure gauge or electronic pressure sensor, or it can simply be plugged using the port plug provided.